The name of the building material to which this journal is dedicated, concrete, was already known to the Romans under the name of ‘opus caementitium’. The name of the art gallery ‘Locus Caementitium’ that opened in Cologne about a year ago not only draws attention to the common constitutive elements of the art objects on display. It also wants to raise awareness of the long arts and crafts tradition of this building material that is today often regarded as the epitome of modernism. Elfi Pohl’s art gallery ‘Locus Caementitium’ is located on Barborassaplatz square in the southern part of Cologne. Here, the long-standing member of the Concrete Information Service has been showing art objects of this oft-vilified material for over 15 months now. The project could be termed ’stone art created from artificial stone.’ However – as the independent curator strongly emphasizes – the oeuvres on display not only comprise sculptures and installations of this cementitious mix, but also objects for day-to-day use. They range from furniture pieces to tableware to small accessories. For this mix of utility and art objects she frequently encounters animosity from other Cologne gallery owners. She herself sees in this open concept and the sole restriction to this material the secret of her success: Taking sublime art down a bit from its stony and elite pedestal pleases her. The countless letters she receives from all over the world confirm her in her attitude. Their writers – whether artists or customers – are all enthusiastic about her worldwide unique platform. Yet, she does not want to have her gallery understood as a showroom of professional concrete furniture makers. There exist, indeed, already a small number of small factories where regular lines of concrete furniture are developed and marketed. It goes without saying that Elfi Pohl is in touch with these manufacturers, whose names she is always pleased to pass on if so requested. However, in her exhibition she wants to place unique and one-of-a-kind objects or limited small series. 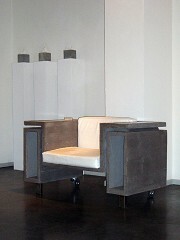 Furniture pieces made of concrete will be shown in the gallery until mid- March. Apart from a ground and polished dinner table made of high-performance self-compacting concrete, there are cabinets of traditional architectural concrete aesthetic with formed surface finish: concrete brut. 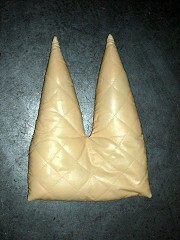 But not only the eye, the searching hand, too, is often surprised: seated only moments ago in a concrete arm chair, comfortably upholstered with leather cushions, it encounters the so-called Kölner Domkissen (Cologne Cathedral cushion): The artificial stone has a deceptively textured look, even when inspected at a close distance, and only a disbelieving touch reveals the cold truth. Among the customers of the gallery owner are many architects who value just this archaic minimal art as interior decoration There are many architects among the customers of the gallery owner who value highly this archaic minimal art as interior decoration. She warns, however, that concrete is a very sensitive material, despite its partly rough character: Those not willing to accept the inevitable circular stains that glasses will sooner or later leave behind would be well-advised to choose a different material.